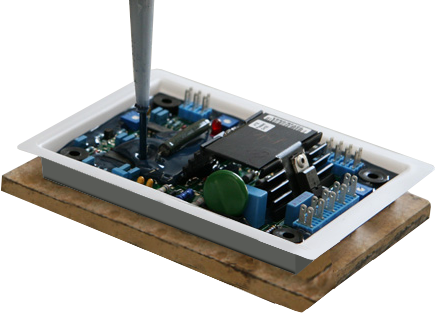 TIM-PC series are pourable, filled Silicone Free epoxy resin or silicone resin systems offering excellent heat transfer, high voltage insulation, low exothermic and minimum shrinkage. These compounds transfer heat rapidly, thereby eliminating hot spots and increasing the operating efficiency of most encapsulated devices. The low shrinkage design feature minimizes risk of damage to fragile components. These products are designed for protecting components in applications such as densely packaged power supplies and heat generating components, integrated circuits, power and operational amplifiers, transformers and many types of semiconductors. Flexible impact resistance. High Temp Stable up to 230°C.